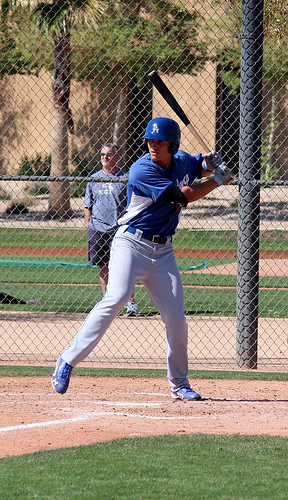 This is the finale of a 5-part series detailing my Top 50 Dodgers’ prospects. These are scouting reports for Nos. 1-10. It looks like the Dodgers hit big on their 2012 first-round pick in Seager. His debut season was solid, and his sophomore season was even better. Seager began with Great Lakes and ripped up the league, hitting .309/.389/.529. A .918 OPS in the Midwest League as a 19-year-old is fantastic. A late-season promotion to Rancho Cucamonga didn’t go well (.160/.246/.320) and he struggled in the Arizona Fall League. But that shouldn’t matter too much. Seager uses his pure and smooth left-handed stroke to generate the best bat speed in the system. He has average power now and projects to have above-average power at his peak. He also has good opposite-field power. Seager is a polished hitter for being as young as he is, as he’s willing to go the other way and he’s more than willing to take a walk. He has a hole in his swing (inside corner) that could get exposed by advanced pitching, but he’s a good enough hitter to adjust to it. There’s still a lot of projection left in his body, but he’s starting to fill out, hence the plus-power potential. There isn’t much question about his offensive ability. His defensive position should change. Some in the organization think he can stick at shortstop, although that opinion is changing a bit. At worst, Seager is an average third baseman. He’s adept at shortstop, but his size and range should prevent him from playing there in the majors. He has a quick first step, soft hands and plenty of arm for either position. If he were to play shortstop in the bigs, however, he’d be the biggest shortstop to ever play the position. 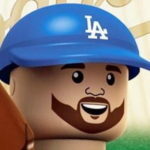 His final destination on the diamond is likely at third base, but the Dodgers are going to keep him at shortstop for a lot of the 2014 season. He’ll begin in Rancho Cucamonga with a midseason promotion to Chattanooga more than likely. Pederson established himself as a legitimate Top 40 prospect in baseball with a really good season in Double-A. He was one of the league’s youngest players, and one of its top performers. Pederson uses his strong hands and wrists to generate plus-bat speed and has flashed plus-power potential in batting practice. That power potential is carrying over to game action. Once considered a fourth outfielder by some, Pederson profiles — at worst — as a second-division starter, possibly in center field. His hit tool trails only Seager’s in the system, but he might have a better eye than the teenager. He’s a pull hitter, but has shown a willingness to go the opposite way at times. Pederson also improved his defense in 2013, making a future home in center field a real possibility. His arm is a tick above-average and while he probably profiles better in left field, he could handle center field long-term. He also improved his baserunning. After stealing just 26-of-40 bases in High-A in 2012, he stole 31-of-39 bases at the most telling level of the minor leagues. He should begin 2014 with the Albuquerque Isotopes and will almost certainly debut in the majors at some point. Lee is basically the pitching version of Pederson (kinda). He’s underrated by most and has a future as a regular in the majors. Lee was facing advanced competition at age-21 in the Southern League and more than held his own. He was my Dodgers’ Minor League Pitcher of the Year, and the Dodgers bestowed upon him the same honor. He posted career-bests in almost every major pitching category. What’s most impressive is he not only increased his strikeout rate, but also reduced his walk rate. Lee has a fastball that sits in the 89-92 MPH range and touches 95 MPH at times. He can cut and sink it to get outs as well. His best secondary pitch is a low-80s slider, which features inconsistent two-plane break. It flashes plus at times, but he can get under it at times. He also has a changeup that has above-average potential. It’s also a low-80s pitch and he gets good downward movement against left-handers. Lee also has a curveball he uses less than the other two secondary offerings that is an average pitch. His delivery is smooth and repeatable. Combine his repertoire, poise, athleticism and pitchability, and there’s a No. 3 or 4 starter there. He’ll need to improve his stamina (5.4 innings pitched per start) and be more consistent with his off-speed pitches to reach that. The Dodgers could start Lee at Albuquerque, but it’s understandable if they send him back to Chattanooga. Either way — he’s nearly MLB-ready and should debut in 2014. Urias was the talk of the Dodgers’ farm system after making his professional debut in May — and what a debut it was. Urias signed for roughly $1 million out of Mexico in 2012 and figured to pitch in short-season ball in 2013. His full-season assignment was a shock to most outside the organization. Urias didn’t do anything to fuel the naysayers. His 2.48 ERA, 1.10 WHIP, 2.7 BB/9 and 11.1 K/9 are really, really good numbers for, say, a 19- or 20-year old in the Midwest League. Urias did it at 16. 16 years old. Amazing. His fastball is an 89-93 MPH offering that routinely touches 95 MPH and got as high as 97 MPH (as a 16-year-old!). It doesn’t do a whole lot, but it features a little arm-side run and projects as a plus-pitch. His best off-speed pitch can be debated. His changeup is nasty at times, but also a touch inconsistent. It features good diving action that can get a considerable number swing-throughs from righties. His curveball is a low-to-mid-70s pitch that is a little loopy at times. But when he gets on top of it, it almost acts more like a slider in its break. His command and control are surprisingly advanced for a young teenager, but he’ll need to continue to work on it going forward. His delivery is polished and repeatable. But, Urias’ best attribute might be his poise on the mound. He pitches like a pitcher well beyond his years. He has more poise than some Major League pitchers. It’s hard to project a phenom at times, and Urias is no different. If everything comes together, he’s a future ace. As of now, he looks no worse than a No. 3, but more likely a No. 2 starter. An aggressive assignment to the California League could be in order, but it’s entirely possible the Dodgers could have Urias begin back in the Midwest League before a promotion. He’s only 17, after all. The Dodgers signed Guerrero two times before officially signing him to a 4-year, $28 million (with incentives up to $32 million) contract in October. Guerrero spent some time in the Dominican Winter League, but a hamstring injury hampered his ability to play and showcase his talents. The Cuban import isn’t the next Yasiel Puig, but he should be an above-average offensive second baseman. Guerrero’s best tool is his bat, and he shows surprising pop for a second baseman. His swing looks effortless at times and he has good bat speed. He’s not opposed to going the other way and shorten up his swing with two strikes. He won’t be a threat on the basepaths, but he also won’t be a base-clogger. Guerrero was a shortstop in Cuba, but it’d be a surprise if he played there long-term in the majors. He’s a little stiff defensively and doesn’t have the greatest range. His arm is strong enough to play shortstop, but it profiles much better at second base, and he’s athletic enough to handle second. If he works at it, he could be a plus-defender, but the Dodgers would probably settle for average defensive ability at the position. Some penciled him in as the Dodgers’ opening day second baseman (present company included), but with an injury-riddled winter, it’s entirely possible he could begin the season in the minors with a quick call-up after some seasoning. As an older prospect, he might not need more than a month or so in the minors. Stripling was the Dodgers’ fifth-round pick in the 2012 draft, he signed for nearly $100,000 less than slot — and he looks like an absolute steal. He isn’t Michael Wacha (his teammate at Texas A&M), but he has some of the same attributes as the budding Cardinals’ star. Stripling uses a four-seam fastball that is an 89-92 MPH pitch that touches 94-95 MPH on occasion. His mid-70s curveball is his best off-speed pitch. He throws it at 12-6 and it gets good downward movement when he snaps it off right. He also throws a high-70s/low-80s changeup that is a weapon against left-handed hitters. He also added a slider for the 2013 season that is still a work in progress. His delivery is smooth and repeatable, leading to some of the best command/control in the system. From the stretch, he clocks in around 1.4 seconds. His arm angle is over the top, which allows him to get some nice downward plane on his pitches. Stripling has at least average athleticism on the mound. For me, he projects as a No. 4 starter with a low-end No. 3 ceiling. His floor is a quality reliever who could see his velocity tick up a bit in that role, but he struggled in that role with the Lookouts this season. He threw nearly 100 innings at Double-A, so a promotion to Triple-A could be in order. After Lee, Stripling could be the Dodger starting pitching prospect next in line to make MLB debut. 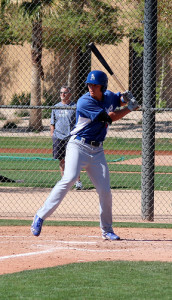 Anderson was the 18th overall selection in the 2013 draft, and the Dodgers found another good one. Despite being a college junior, he was drafted as a 20-year-old. Anderson was overused a bit at Jacksonville University, causing him to drop from a preseason Top-10 pick to a mid-first-rounder. Despite that, he showed real promise in his professional debut. He has three pitches that should be at least average. He throws heavy fastball in the 92-94 MPH range and can run it up to 96-97 MPH at times. He gets good sink on the pitch. It’s by far his best pitch. Anderson also features a slider that flashes plus-potential at times. He gets solid tilt on the pitch that sits in the low-80s. He can get a little inconsistent with the pitch at times, causing it to go flat. His changeup might be his best secondary offering. It’s also a low-80s pitch that he throws more consistently well than his slider. It’s his primary weapon against lefties. Anderson also has a curveball that’s little more than a “show me” pitch. It doesn’t project to be much more than a below-average offering. Anderson’s delivery isn’t as picturesque as Lee or Stripling’s, but there’s potential for it to be cleaned up, thus improving his command/control. Right now, that’s his biggest weakness. Anderson’s ceiling is a No. 2 starter. More likely, he’s a No. 3 or 4 starter. If his off-speed pitches don’t improve enough, he could be a nasty back-end reliever, possibly a closer. He should go to the hitter-friendly California League to begin 2014, with a promotion to Chattanooga more than likely. A personal “favorite” of mine, Reed reinvented himself a bit in 2013. A college reliever who got plenty of swings-and-misses, Reed transformed into a groundball pitcher, with mixed results. The 2011 first-round pick spent all of 2013 in the Southern League and enjoyed moderate success. Reed’s fastball is an 89-92 MPH offering that rarely touches 94-95 MPH as a starter. He sinks at 88-91 MPH it to get a better groundball rate than the pitchers rated ahead of him on this list. His slider is his best secondary pitch, but it’s been quite inconsistent in his career. At times, it flashes plus-plus potential, but it has the potential to be just average because he can’t throw it from a consistent arm slot. Reed also has a changeup that is a below-average pitch and doesn’t project to be much more than that. He throws his pitches from a three-quarters arm slot that has yet to be conducive to great command. The converted college reliever doesn’t have a great chance of sticking in the rotation. His mechanics aren’t smooth enough to have an easy, repeatable delivery. He’s likely a reliever at the next level, but there’s an extreme outside chance he remains as a starter if he can nail down a third pitch. If he goes to the bullpen, he could re-reinvent himself as a power lefty with a sinker that can’t be touched, but he’ll need to improve his command for that to happen. If he sticks in the rotation, he’s a No. 4 or 5 starter. After spending all of 2013 at Double-A, it isn’t unrealistic for the Dodgers to send him to Triple-A. If things fall his way (which means things aren’t going well in LA), he could make his big league debut in 2014. Garcia was the Dodgers’ third-round draft pick in 2012, and reports said he would have been the Dodgers’ selection over Reed in the 2011 draft, if he were eligible. A native of Cuba, Garcia has the most potential of any Dodger pitcher in the system, but there are a number of issues would need to overcome to realize that potential. Garcia throws a heavy fastball that sits in the 90-93 MPH range. He touches 95 MPH with the pitch at times with some heavy sink. He gets natural arm-side run with the pitch that he throws from a high three-quarters arm slot. His high-70s/low-80s curveball acts more like a slider than a curve because of its tight spin. It’s also the pitch on which he gets a lot of swing-throughs. Garcia has toyed with a changeup in the past, but it’s not even a “show me” pitch at this point. He’s really similar to Reed, but has better velocity. His mechanics aren’t technically sound, as his delivery looks as if he’s “pushing” the ball toward the plate. The arm slot is fine, but his mechanics don’t lend themselves to being easily repeatable, and his command/control will suffer because of it. He profiles as a nasty late-inning reliever from the left side who should be able to get righties out with his plus-curveball. Garcia made his MLB debut in 2013, but there’s little chance he begins 2014 in Los Angeles without an injury ahead of him. Likely, he’ll go back to Triple-A, where he pitched in August for a few weeks before being promoted to the Dodgers in September. Magill made his Major League debut in 2013 and was fantastic against the Brewers. He went 6 2/3 innings, gave up two runs and struck out seven. It looked like he might stick when the Dodgers needed pitching depth. However, he got roughed up in most of his remaining outings and ended up walking more batters (28) than he struck out (26). He was jerked around in the minors, having outings canceled, postponed or shortened on the off chance the Dodgers might need to recall him. In 2014, he should benefit from some consistently. Magill’s fastball is an 89-93 MPH pitch that touches 94 MPH at times. He’s able to get some movement on the pitch to throw a decent 2-seamer. His best off-speed pitch is his low-80s slider that flashes plus-potential at times. It’s still inconsistent and he has trouble locating it at times. He also has a changeup that has solid-average potential. His curveball is almost not worth mentioning. He’ll need to improve both pitches if he’s going to remain a starting pitcher. He draws comparisons to former Dodger Tim Belcher, as his delivery is reminiscent. He throws from an over-the-top arm slot and his delivery appears to be repeatable. But Magill has trouble repeating it, which leads to his mechanics getting thrown off, which leads to below-average command. He seemed to have made strides in that department in 2012, and he showed an ability to throw his pitches for strikes in the minors. But the Major League stage proved to be quite the hurdle for him. If he can’t consistently repeat his mechanics and throw strikes, a bullpen role might be in his future. His fastball could play up out of the ‘pen, and he could ditch his changeup and curveball in favor of working on his slider. He’ll go back to Albuquerque in 2014 with a chance to contribute to the Dodgers in some capacity this season. Next Yasiel Puig, Leadoff Hitter?